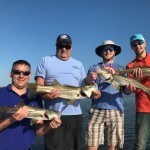 Hello Capt Matt here from Anna Maria island fishing charters here in Tampa Bay. Sorry it’s been a little while since my last report. I have been crazy busy, it’s hard to keep up with some of the little extra things like a fishing report. My main objective every day is putting my customer on to quality fishing and that pretty much consumes most of my time this time of year. Anyway here is a quick rundown. The offshore fishing remains stellar. Kingfish, snapper, cobia, permit, mackerel, and tunny are biting like crazy literally. The action has been fast every day I can honestly say we haven’t had a slow day offshore in April. My fisherman that have asked for larger fish I have been a hundred percent on goliath grouper over 200 pounds, and there is all the sharks you can stand to fight mixed in feeding on the pelagic fish. My largest fish this past week was a solid 400 pound goliath grouper. Inshore the snook fishing remains very good. The trout fishing has really picked up for me as well, plenty of keeper trout with a lot of consistency. The red fishing still has not been spectacular for me I am catching keeper mixed in with the snook. To be honest though I haven’t been looking for reds much, most of my time has been spent offshore the remainder of the time snook and trout fishing inshore. Peak tarpon is right around the corner. I plan on hitting them hard the end of this week. If anyone is interested I just had a cancelation for June 1,2 and 3 premium tarpon dates. I do have a few other slots scattered out throughout peek season.